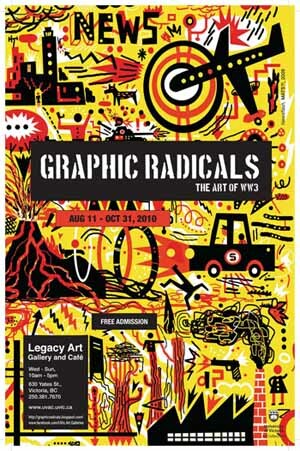 Graphic Radicals was a themed presentation of the work of World War 3 Illustrated, a New York artist collective, from the 1980s to the present day. 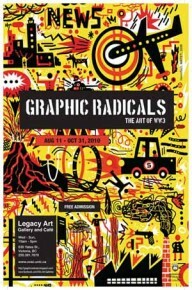 The art confronted issues such as anti-war protests, squatting in New York, the tragedies of 9-11, racism, prisons and anarchism through a variety of mediums including posters, graphic illustrations, paintings, banners and other media. This entry was posted in Legacy Downtown, Online Projects, Past Exhibition, UVic Faculty and Alumni and tagged Drawing, multimedia, Photography, Posters on 31 October, 2010 by khughes.